Try your hand at edible gardening this year! Every spring season we see new landscaping trends. If you are looking to enhance or transform your outdoor living space, you have come to the right place. We have compiled a list of some of the most popular spring landscaping trends of 2018. Consider the following for your property this spring season! 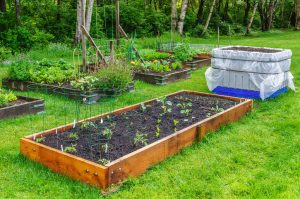 We have seen a dramatic spike in the number of homeowners who are taking advantage of edible gardening in 2018. Not only is edible gardening fun and will save you money on produce, but it is also incredibly rewarding. The fulfillment you receive by growing your own vegetables and herbs makes them taste even better! Are you someone who likes to entertain? If you fall into this category of homeowners, consider incorporating a dining area into your backyard. If the weather is beautiful, fire up the grill and treat your friends and family members to meals outside. You can create a gorgeous space by investing in just a small patio, along with some elegant outdoor dining furniture. When you are not entertaining, this can serve as a great place to sit back, relax and enjoy the warm weather. Water features are a hot commodity it 2018. A small basic fountain will provide any backyard with a more tranquil and natural appearance. In addition to being beautiful, a water feature will provide homeowners with relaxation benefits as well. There is something so unbelievably therapeutic about watching the movement of water. Other popular water features include ponds, water gardens, and retaining wall waterfalls. There are many different routes you can take with your landscaping efforts. However, sometimes, less is more when it comes to landscape design. Some of the most beautiful residential landscapes are the simplest! The minimalist approach can provide your yard with a clean and sophisticated appearance. Many homeowners make the mistake of trying to do too much with their landscaping efforts and their yards end up looking either tacky or crowded. This entry was posted on Friday, June 1st, 2018 at 10:20 am. Both comments and pings are currently closed.